American Bar Association says lawyers can visit social media sites of jurors, even during deliberations. Facebook changing right-hand-side ads this week. These stories, and more, in today's Morning Social Media Newsfeed. Lawyers have been given the green light to scan the social media sites of jurors. 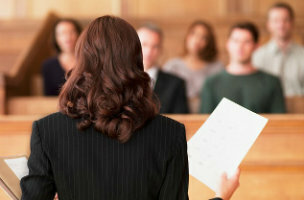 The American Bar Association says it’s ethical for lawyers to scour online for publicly available musings of citizens called for jury service — and even jurors in deliberations. KWTX The “formal opinion” was issued in April and will serve as an ethical guideline for the nation’s lawyers. The ABA’s ethics committee began reviewing the issue about two years ago and concluded that looking at Facebook posts, tweets and other information gathered passively is ethical research. Mod Vive Honestly, this practice has likely been occurring for years. Social media has already become a wealth of information for attorneys in both civil and criminal cases to find information on the opposing party. Facebook announced that it will begin rolling out its redesigned right-hand-side ads early this week. The revamp of those ad units was originally announced in April. Writing for Entrepreneur, digital marketing consultant Brett Relander offered up five common sense yet often overlooked social media hacks to grow your business: know what’s hot, speak the language of social media, grow your base, save time and embrace change. Automating certain activities such as sharing content across platforms, sending email and SMS updates on topics of interest, and uploading social media content to remote storage saves time and can be utilized by either enterprise-level or grassroots organizational systems. A company called Modus Operandi is developing a “social network” interface with profiles of the bad guys who want to do you harm. Terrorists, mainly. The Guardian has a fascinating interview with Twitter co-founder Biz Stone, who is promoting his new book, “Things A Little Bird Told Me.” The juicy bits are found in Stone’s recollection of meetings with Mark Zuckerberg, back when the Facebook founder was thinking about buying Twitter. Still no official word on that acquisition reported by Variety last month, but YouTube and Twitch are getting together in a different way. When Twitch broadcasters who also use YouTube turn on a new feature called Live Annotations, a notification like this will automatically appear over their YouTube videos once they start a new live broadcast. John Stamos was squeaky clean back in his “Full House” days, but earlier this week, he got a little risque with one of Vine’s most notorious pranksters. Prolific Vine user Jerome Jarre, who is known for springing up on people armed with kisses, tried to surprise Stamos. But Stamos was ready. The number of public school teachers facing disciplinary action in Tennessee is on the rise, and social media could be partly to blame. A Chattanooga Times Free Press review of disciplinary data over the past decade data shows teachers are increasingly failing to maintain appropriate boundaries as the proliferation of social media facilitates constant communication between teacher and student. The John S. and James L. Knight Foundation, an organization that promotes innovation in journalism, is sponsoring a new comments infrastructure project for journalism sites to the tune of $3.9 million. According to The Times digital media reporter Leslie Kaufman, the infrastructure will take around two years to build, and the platform will be offered to other news organizations for free once the project is complete.